Everest Base Camp is the ultimate bucket list trek. 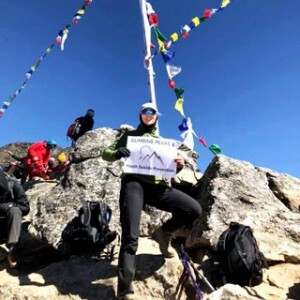 This trek takes us to this stark and barren place as well as giving us amazing close up views of Mt Everest and the surrounding enormous peaks in the region. We really do get to experience the “top of the world” on this trek with many opportunities to see and photograph this iconic place. Starting with a flight into Lukla airport, the most incredible mountain airport in the world before walking along the gorge and emerging into a stunning mountain vista at Namche. Enjoy visiting some monasteries in the region, watching the monks doing their prayers and learning about the culture of the Sherpa people and their Buddhist traditions. Lukla Airport – the most incredible mountain airport in the world. Monasteries and rich Sherpa culture of the region. Monks performing their afternoon prayers in Tengboche Monastery. Picturesque Namche Bazaar – the main hub of the region. Everest Base Camp – the starting point for Everest expeditions. 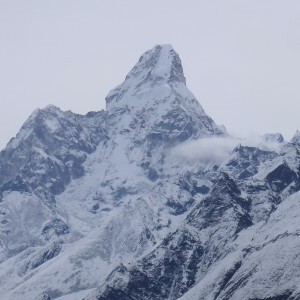 Kala Pattar – the postcard panoramic viewpoint of the Everest Range. Day 3Fly to Lukla (2840m) then trek toPhakding (2610m) 8.5km 4 hrs It’s an exciting morning with a scenic mountain flight to Lukla, the most amazing airport in the world. Be sure to get a seat on the left hand side of the plane so you can see the peaks of the Himalayas on the way. On arrival in Lukla we stop for some breakfast beside the airport where we can watch the planes arriving. After breakfast it’s an easy walk to Phakding where we can explore the surrounding area or just rest after our first day trekking. Included meals – breakfast, lunch, dinner. Day 4Phakding (2610m) to Namche Bazaar (3440m) 10.5km 6-8 hrs We begin the day at Phakding and walk along the gorge past waterfalls and beautiful scenery until we arrive at the highest suspension bridge on our trek. From here it’s a steep uphill (and one of the hardest climbs on the trek) climb for around 4 hours before arriving at Namche Bazaar. Included meals – breakfast, lunch, dinner. Day 5Namche – acclimatization day This morning we walk above Namche via the NamcheGompa (Monastery) where we can learn a little about the traditional Buddhist Monasteries and Sherpa history of the region. On climbing the hill above Namche we can view the Everest View Hotel and get a panoramic view of the mountain ranges that surround us. We also can get a great view of Mt Everest from this spot. We return to Namche via the Syangboche Airstrip and have the afternoon free for last minute shopping or watching the Sherpa movie at one of the local café’s.Included meals – breakfast, lunch, dinner. Day 6Namche (3440m) to Tengboche (3870m) 5hrs Today we walk to Tengboche which is the location of one of the biggest monasteries in the area. The highlight of our day is the opportunity to watch the monks perform their afternoon prayers. Tengbocheis a small village located on the ridge top with an incredible mountain panorama surrounding it. Included meals – breakfast, lunch, dinner. Day 7Tengboche (3870m) to Dingboche (4360m) 5-6hrs Today we continue our ascent starting with a walk though beautiful rhododendron forest before the track opens up and winds through small villages, past chortens, mani walls and raging streams. We walk under the watchful eye of Mt AmaDablam today arriving at the beautiful village of Dingboche located at the confluence of 3 valleys. Included meals – breakfast, lunch, dinner. Day 8Dingboche acclimatization day walk to Chhukhung (4730m) 6 hrs return We have a rest day today for acclimatization. It’s a great opportunity for us to walk to Chukkhung. This takes us up the ImjaKhola valley to a land with glacial moraines amidst towering mountains. Lhotse is on our left and AmaDablam is on our right as we walk and the track ahead goes to Island Peak. We return back to Dingboche for the night. Included meals – breakfast, lunch, dinner. Day 9Dingboche (4360m) to Lobuche (4940m) 5-6hrs As we leave Dingboche today the scenery is one of dramatic peaks, we are walking through sweeping arid terrain now with awesome peaks on all sides. At the top of the valley is the Chola Lake that we can see on our way past. On arrival at Lobuche we can take in the panoramic view of this pretty small village surrounded on all sides by big peaks. Included meals – breakfast, lunch, dinner. Day 10Lobuche (4940m) to GorakShep (5170m) then Everest Base Camp Return 4-6 hrs The trail to GorakShep runs through a gully that has the lateral moraine of the Khumbu Glacier on the right hand side. It is a landscape of stark grandeur with magnificent peaks all around. After having lunch at GorakShep we will carry on to Everest Base Camp which is a stark and lifeless place. 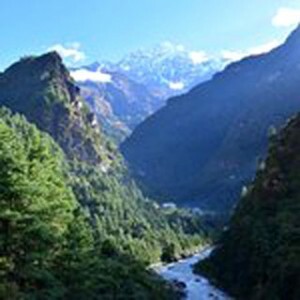 Nestled at the foot of Mt Everest and other massive peaks and perched on the edge of the Khumbu Glacier. It is a beautiful and yet barren place. With strange boulders perched on top of one another and interesting ice formations. This is the starting point for many of the climbing expeditions to Mt Everest. We then return to GorakShep where we spend the night. Included meals – breakfast, lunch, dinner. Day 11GorakShep (5170m) to Kala Pattar (5545m) return 4.2km 4 hrs to Pheriche (4358m) 4hrs Early morning we trek to Kala Pattar, a steep rocky hill with a close up view of Mt Everest and the peaks surrounding it. This is the classic view of the Everest range. After lunch at GorakShep we head down to Pheriche for the night. Included meals – breakfast, lunch, dinner. Day 12Pheriche (4358m) to Namche (3440m) 12 km 7-8hrs It’s a fairly easy walk today along the mountainside with stunning views as we head back to Namche today. Included meals – breakfast, lunch, dinner. Day 13Namche (3440m) to Lukla (2840m) 19 km 6-8 hrs It’s quite a long walk back to Lukla today but as it’s all downhill it’s not difficult. Included meals – breakfast, lunch, dinner. Day 14Lukla to Kathmandu Today we fly back to Kathmandu where we can do some shopping in Thamel or sightseeing. This evening we will have a group farewell dinner and cultural show.Overnight in Kathmandu. Included meals – breakfast, dinner. Day 15Departure day You are free to depart at any time. Transfer to the airport will be arranged for you. Included meals – breakfast. Arjun Jumkatel of the Nepalese Mountain Hub organised my whole trip to Everest Basecamp including guide & porter. I was trekking by myself hence organization was important to me. Arjun created a safe trip for me with central luxury accommodation in Kathmandu at a reasonable price. I was looked after superbly in the tea houses while trekking; the chosen guide was an expert who gave me mountaineering tips on the way which I appreciated. Changes or variations to the schedule were quickly adhered to. Nothing was ever a problem. Once the Basecamp trip was completed, Arjun took me to a beautiful restaurant celebrating my success while experiencing a Nepalese feast and dancing. I am confident in stating that I would use Arjun again in the future and recommend him to friends and family. He operates his business from the heart; not just for the money!! A friend and I traveled to Nepal to trek to Everest Base Camp (EBC) and also do some charitable work in a small village. Nepal Mountain Hub (NMH) and Arjun were highly recommended to us by a friend. They were awesome, from the moment we arrived at the airport to the minute we left a month later, welcoming, friendly, professional, knowledgeable. The Everest Base Camp trek was breathtaking and I would strongly recommend to any person regardless of age or experience. This organising, NMH, are more than happy to personalise and adapt any trip or experience to your needs. The main reason we enjoyed our time so much in Nepal was because of NMH and our amazing guide Arjun. Wouldn’t have changed a thing! Thank you! 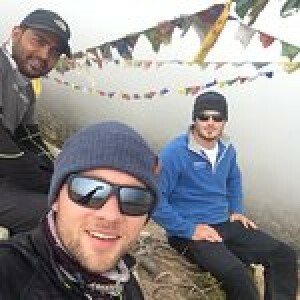 In October 2017 a freind and me went on a trek to Everest Base Camp with Nepal Mountain Hub. It was an incredible experience and our guide Arjun was fantastic. Following the trek Arjun helped us with a charity project in a village which had been destroyed by the earthquake. Can’t thank the team at NMH enough, looking forward to going back. Professional guide led me during whole trekking. I enjoyed and learned a lot also. I never forget how beautiful in the Mount Everest. I hope I will come back again one day, and I must to recommend Nepal Mountain Hub Treks to my friends, thank them so much.